The Horn Book Blog carried a review earlier this month of Water is Water: A Book About the Water Cycle by Miranda Paul with illustrations by Jason Chin. 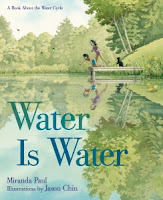 The reviewer says, "...Water Is Water feels like an engaging story about children who love being out in nature." That sounds right up my alley. Jason Chin lives in Vermont. I'm quite certain I read about him in a Burlington area publication while I was up north sometime in the last couple of years.